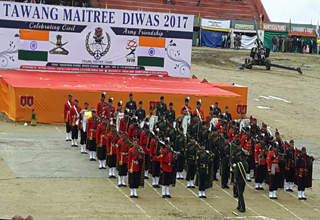 TAWANG, Sep 11: The two-day Tawang Maitree Diwas 2017 concluded at the Indo-Sino border district of Tawang on Monday with renewed friendship between the army and civilian population. Tawang Maitree Diwas is celebrated to foster friendship and to epitomize the excellent relationship between the Indian Army and the local populace of Tawang. Tawang MLA Tsering Tashi, who attended the concluding function, said the event will not only bridge the gap between the army and the local civilians, but also promote tourism in the long run. Tashi appreciated Brigadier MP Singh, Commander 190 Mtn Bde for his effort to revive the Miatree Diwas after a gap of six years. Thousands of people from all over Tawang district were seen gathered at the venue to witness the event. Apart from display of the Indian Army’s might and preparedness to combat any kind of warfare, other added attractions were helicopter fly past, dog show, mule trick show, extravagant cultural performances by school children, army personnel and traditional cultural troupes. ‘Tug-of-Friendship’ as a special event was organised between the Indian Army and local civilians. Blankets were also distributed to BPL families by Tashi at the event. The event was organised jointly by the Indian Army, District Administration and Yuva Arunachal under the chief patronage of Chief Minister Pema Khandu. All army and civilian participants were felicitated by the organsing committee. President of Yuva Arunachal, Chombay Kee thanked the dignitaries, Indian Army personnel, department officers, volunteers, BRO, school teachers, children and others who made the event a grand success.